For this assignment, I wanted to recreate the Name tag while using more tools from the lessons afterwards. 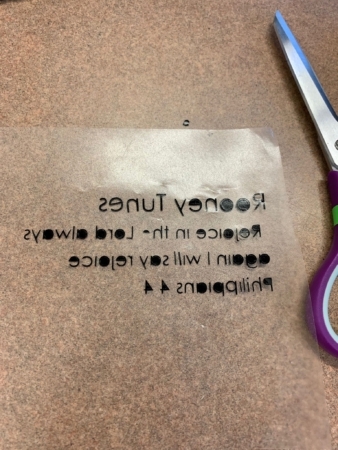 Specifically, I wanted to use the silhouette cutters to add stickers to the name tag and add an LED circuit to add a light to the name tag as well. This would use tools from the second and third assignments to expand upon the design and implementation from the first assignment. My final product for Assignment 1: Laser Name tag. For this new iteration, I wanted to change up the design while still keeping the guitar theme. 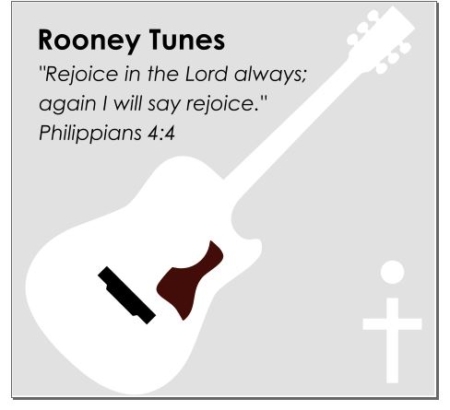 For new inspiration, I used a nickname that I have that also serves as my musician name: “Rooney Tunes”. This is also the name that I have on my Instagram account where I post my different covers. My inspiration behind singing the songs I post is based on one of my favorite Bible verses, which I include in the bio in my Instagram account and decided to include in this name tag as well. Because my Christian faith is important to me, I decided to also add a small cross in the corner of the name tag with a light above it to represent the guiding light that the cross is for me in my faith. Laser cutter design for the iteration assignment. 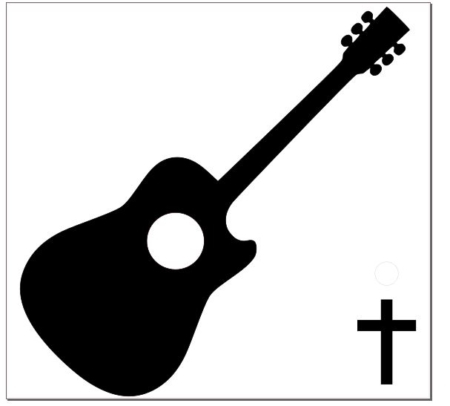 This would raster the guitar and cross and vector cut a circle above the cross. 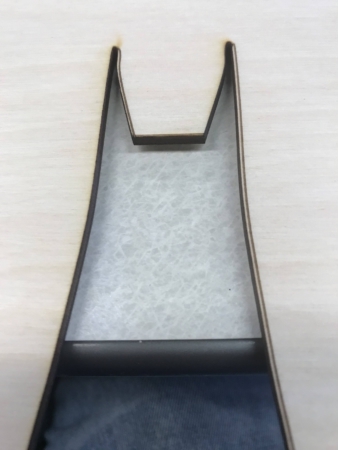 This was the initial design for the silhouette cutter to attach on top of the laser cut/engraved wood. 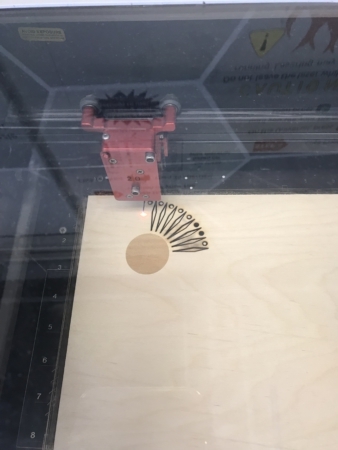 For constructing the project, I began by using the laser cutter. The wood was nicely cut out into a 7.5″ x 7.0″ block on a 1/4″ piece of plywood. 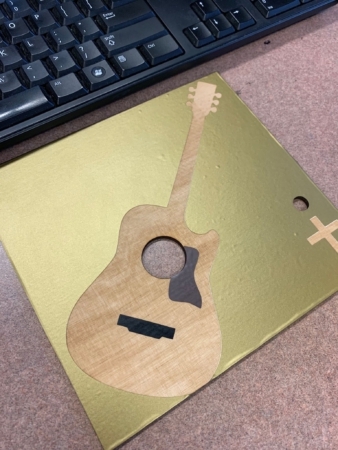 The guitar and cross were rastered on it and the circle for the light was cut out. I unfortunately do not have any pictures or videos of the process. 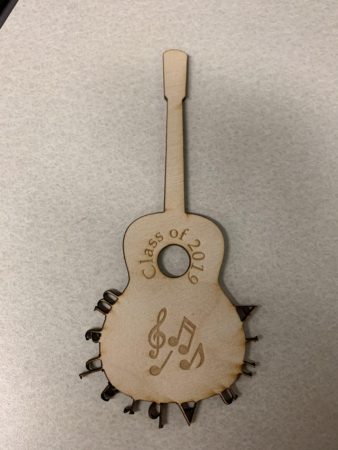 This picture shows the finished laser cut and rastered board along with the outline and guitar accessory stickers. The text that would be put on the top left corner of the name tag shown on the transfer tape. After removing the unnecessary bits in letters like “a”, “o”, “e”, and other letters, I proceeded to put the sticker text on the new name tag. It took a little while as well because the small letters clung to the transfer tape, but for the most part, it transferred well. The final circuit for the iteration project. The switch can be found at the top right part of the circuit. There is one battery, no resistors, and one white LED. This circuit worked well and it all came together pretty well! Overall, I was pretty satisfied with the final product! If I had more time, then maybe I would have added a more complex circuit. I may have chosen a more cooperative font as well. The font was the biggest struggle for my first name tag as well. That first assignment required four iterations once I finally figured out the best size. This one only took one try but did not come out perfectly. 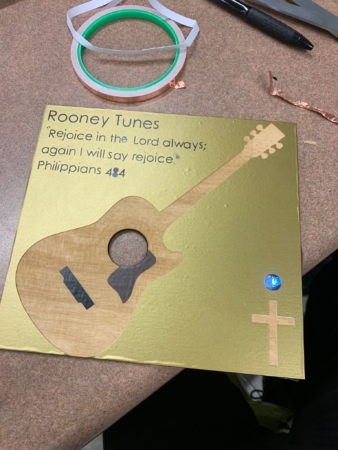 Even though it wasn’t perfect and that may have been a bit frustrating in terms of being patient with transferring as many of the letters as possible onto the main piece of wood, I was content and proud of the final product.I like that the gold sticker frames the guitar and the cross very nicely. The LED light, as well, is a nice touch. If I had more time, I would likely add a better switch or a more clever usage of a switch. The final product for the iteration project. The light was a nice final touch. I wrote in the missing dots and quotations for the sake of completing the text on the name tag. 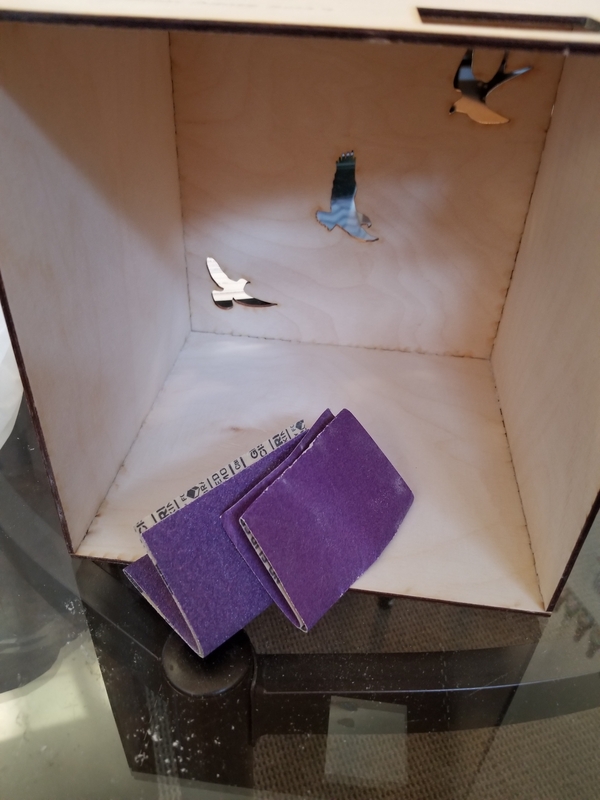 For this iteration project, I originally set out to create a box that would hold my vinyl collection, but I quickly realized that the box would be larger, and more costly than I wanted it to be. 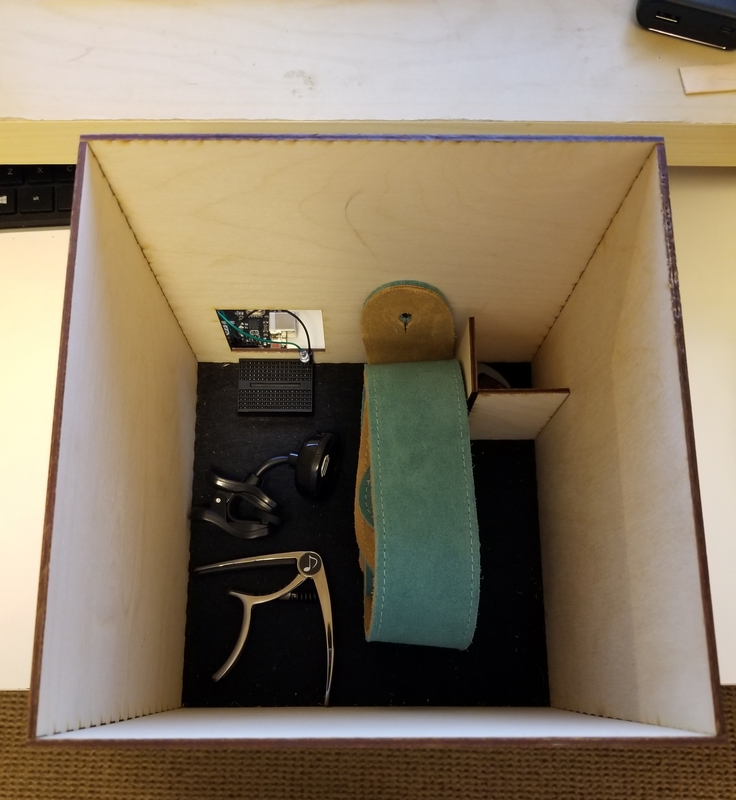 I then tried to think of another box that could be useful and came up with a gear box for my guitar accessories. I did not previously have any type of specific storage for my guitar gear, so this was an exciting project for me. 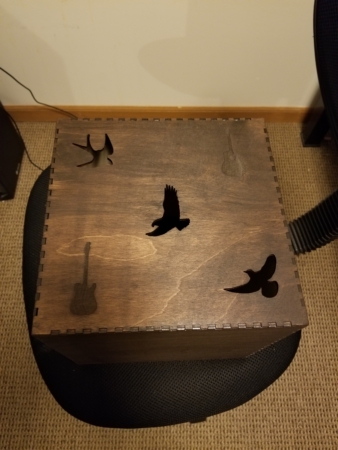 I ultimately wanted to end up with a box that was lined with felt, had a hole for a lighting insert, had a walled off section to hold picks, and a design that featured bird cutouts, guitar rasters, and my name and the year. I mainly wanted to feature my name as an aspect from the laser name tag assignment because this new box would be the same expression of my love for music, but with an increase in difficulty and complexity. This final box would ideally be in my home or future office and would serve as both useful storage and a conversation piece. Please see the sketch below and original laser name tag below. 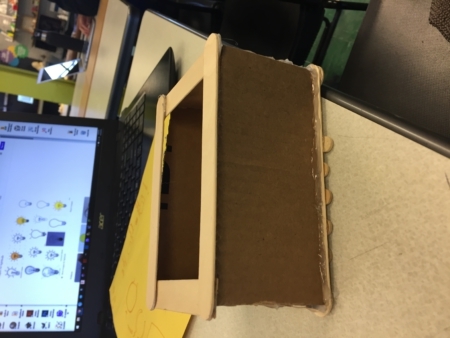 After creating my design, I decided to create a smaller scale box that would be the same design as the final, large box. I did this because I was not one hundred percent sure that the two-piece box was the one that I wanted to commit to. 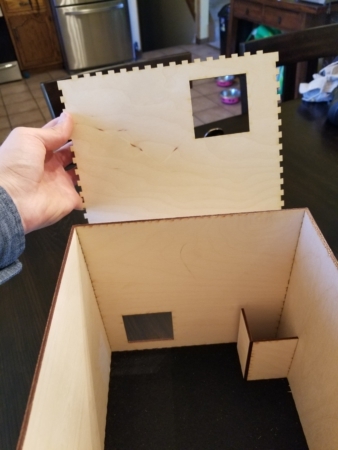 I also wanted to see how the pieces would fit together so that I could have a better understanding of the box for my final design. For both the small scale box and the final box, I used the website www.festi.info/boxes.py. Please see the small scale box below. 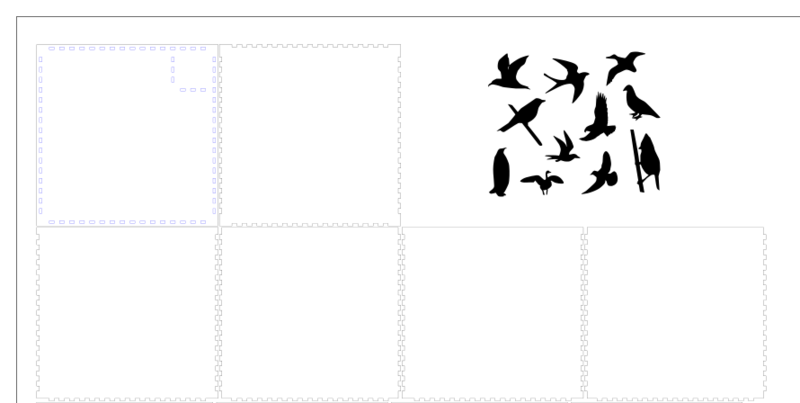 Next, I began making my design alterations to the SVG file that I downloaded from www.festi.info/boxes.py. 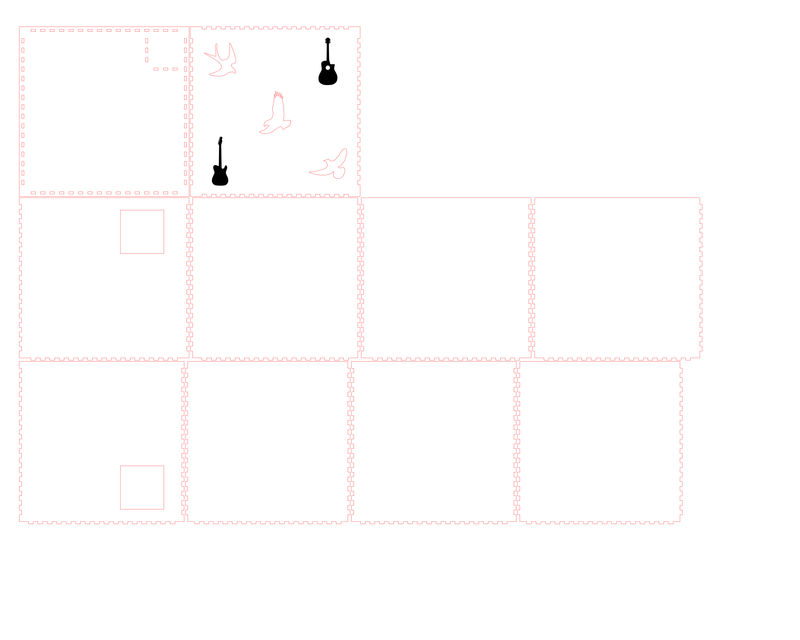 I imported images of birds that would end up being vectored, and guitar silhouettes that would end up being rastered. I then created peg holes for the new walls and two square holes for lighting access. Finally, I added my name and the year. Please see my Inkscape progress pictures below. I then bought some material from Hobby Lobby which included a hobby knife, felt with adhesive, wood conditioner, wood glue, and wood stain. 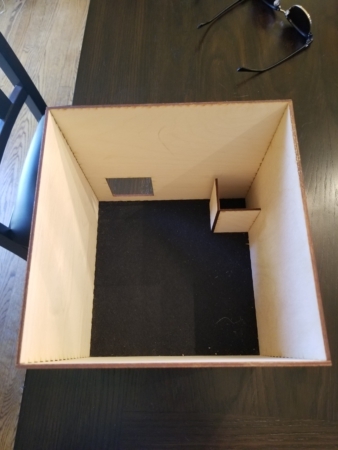 I applied the felt to the bottom of the box and then cut out each hole that the walls would fit into. After this, I fit the walls together and used a rubber mallet to make sure that the walls fit snugly. Please see a picture and video of the felt work below. The walls of the inner box were difficult to fit into the pegs because of the felt, but I ran into a real issue when I realized that I had not designed one of my square holes correctly. 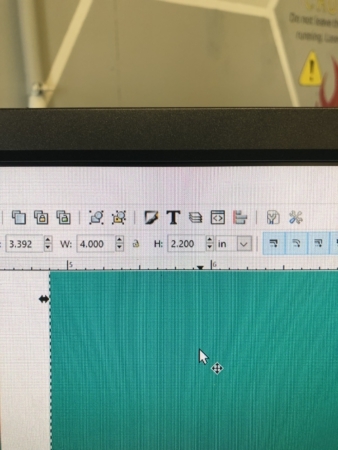 I did not notice that one of the walls in the Inkscape design would have to be flipped when creating the box, so the holes did not line up at all. 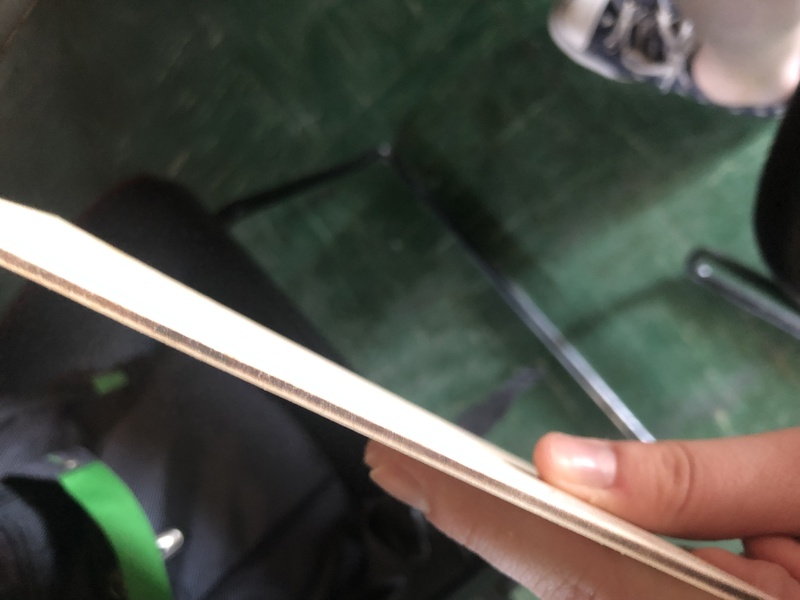 I also cut all the wood that I would need at school and brought all of the materials to my house for weekend assembly. 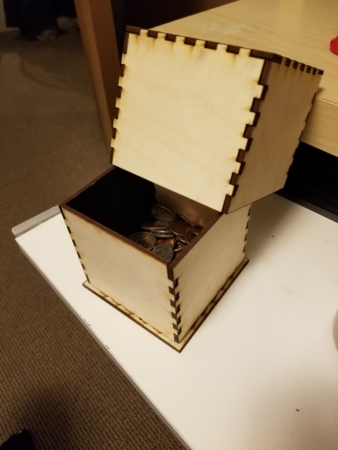 This meant that I had to wait until the Monday after Easter and after the assignment deadline to laser cut a new piece. 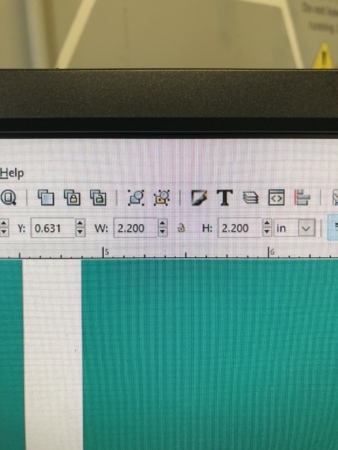 If I had observed my Inkscape design more carefully, I could have avoided this. Please see the progress pictures (including the error) and video below. Finally, I assembled the box with the new outer wall featuring the square hole in the correct position. Another issue that I ran into came from there not being enough play between the inner walls and outer walls. So, I sanded the inside of the outer walls in an attempt to fix the issue. 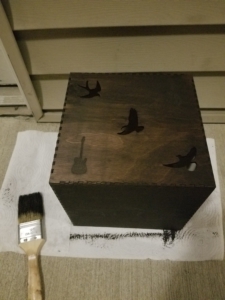 I then applied wood conditioner and wood stain to the outer walls of the box in order to give it the darker look that I wanted. 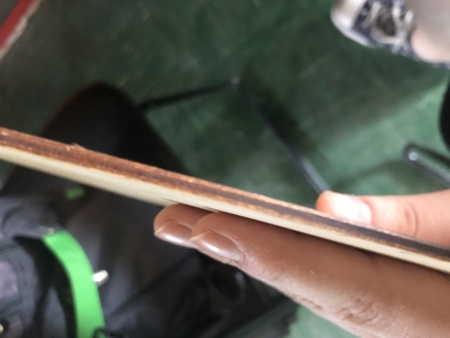 I had never stained wood before, so I used the website https://www.hunker.com/13401316/how-to-stain-and-finish-plywood. And for the light element, I used an Arduino and a breadboard with an LED. The square hole allowed for the breadboard to be inserted neatly into the box. Please see the sanding, staining, and gear pictures below. I think that this has been my favorite Informatics 490 project so far. 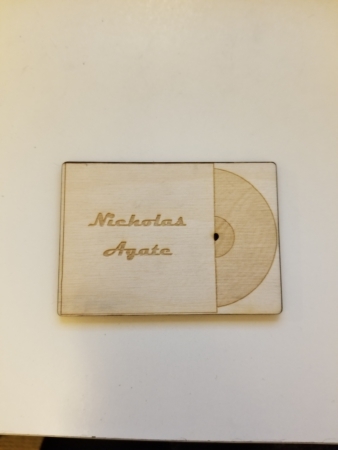 I was able to take inspiration from my original laser name tag that highlighted my love for music, and make a project that is even more meaningful. I ran into bumps along the way, including the hole misalignment and the play between boxes, but I worked hard to fix these issues. Even with these problems, I had fun making this gear box. As I mentioned earlier, I could have avoided the misalignment issue if I had carefully gone over my Inkscape design, so that is what I would do differently next time. Finally, please see the final product pictures and videos below. Thank you for reading. Okay, so, full disclosure I think this is late? I forgot this was due Sunday midnight, between some other deadlines I had running. I’m writing this now because I realize I should have something up; ideally, the finished product will be up only an hour or two after I initially post this. Now that I’ve figured things out, mostly. 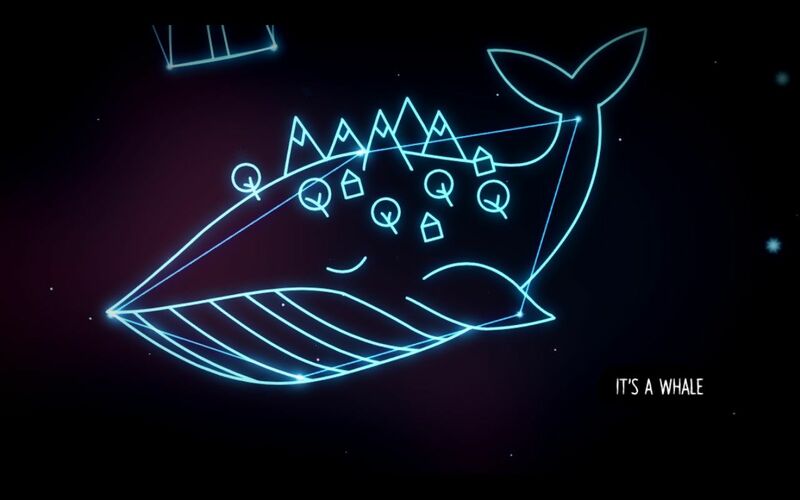 For reference, it says: “I believe in a universe that doesn’t care and people who do.” around a line drawing of a whale. The project I was redoing was my vinyl sticker, redone on an embroidered patch. So for reference, this quote is from a conversation in a video game, during which the characters are looking at constellations. The one the conversation is centered around is this whale, in the bottom right, so I wanted to capitalize on that. Thinner lines aren’t as good for vinyl stickers, so I wanted to try to make it into a patch instead. That in mind, this was the new vector design I ended up with. (I’m really quite proud of this one). First step was embroidery. That by itself was a process. I wanted to make the dark cloud embroidered as well; not just a shape cut out of fabric, so it took a pretty long time. There also wasn’t thick enough fabric in the color I wanted, so I ended up learning how to use stabilizer. 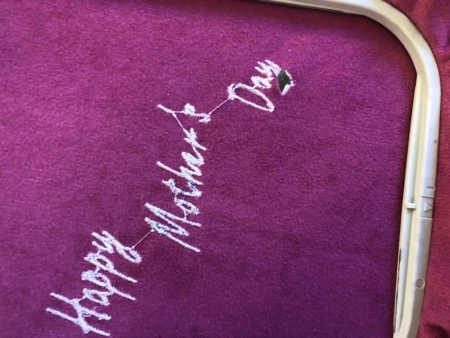 The entire embroidery took about 1 1/2 hours to 2 hours? I remember this because I stayed about 30 minutes past closing time because I was waiting for the embroidery to finish. It went… alright, but the text didn’t come out too clean. I think part of that may have been the font choice (did you know that text doesn’t really translate very well into the embroidery program we use? i know now. You basically have to redo any text you might have on your vector design, which was… fun……. ), and also that the repeated punching of the background + text may have made the lines a little more squiggly. The initial product was definitely pretty hard to read. I spent some time cleaning it up with little scissors + a lint roller, but I don’t seem to have a specific picture of the-after for that. Other than the text, and the stars coming out more like tiny tiny dots, I was pretty happy with it overall. Initially, I was going to try to put the LED’s on the points of the whale where the stars in the original image had been. Upon finishing the patch itself, I realized it was… not the best idea. The patch was too thick to have it poke through, and setting it up to let the LED’s poke through probably would have messed up some structural integrity. So, NEW PLAN: place them around in a sort of framing manner. I was going to use conductive thread + sewable LED’s for this part, which I was pretty excited about. I had 5 LED’s and more or less had the idea of how I wanted to place them. So I then embarked on a Series Of Bad Decisions. Bad decision 1: I decided I wanted to sew them all into place first, and just light them all up at the same time. 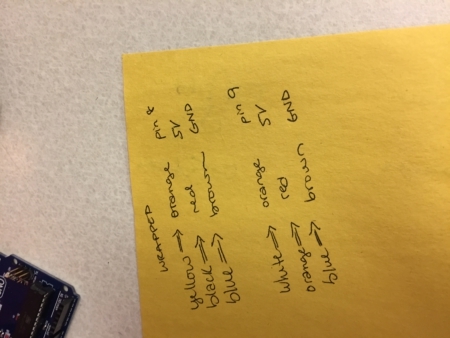 I think at the time, I was 1- trying to make sure I didn’t forget how I wanted to place them and 2- optimize my time in the lab so I wouldn’t have to take home the roll of conductive thread (because I would then be in danger of losing it). That said, it was a pretty terrible decision. 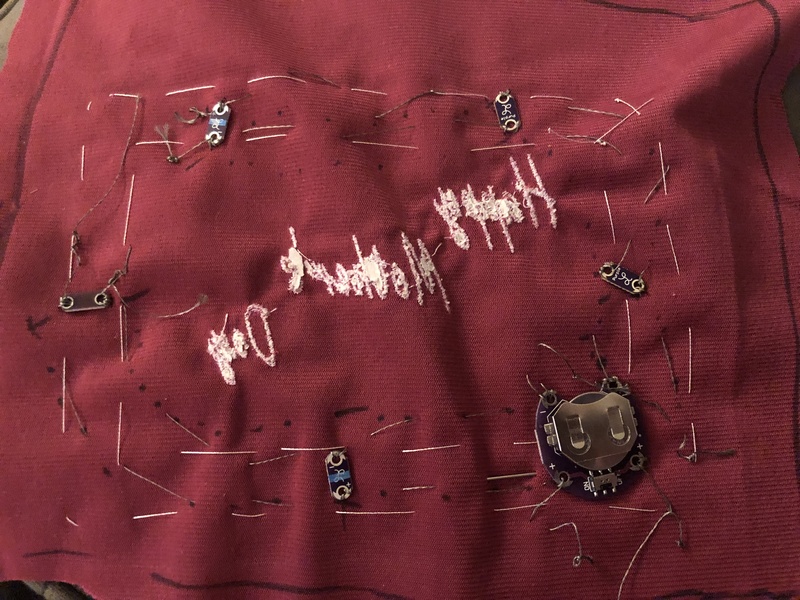 Some knowledge of circuits in my mind and vaguely remembering “the positives and negative lines cant touch!” I sewed all the negative threads first. Which is, as you can tell, a mess. I, staring at it, went, “shoot, I can’t really sew the positive lines without them crisscrossing each other.” and instead of, say, taking them out and trying to do each LED 1 by 1, went. “I will force them not to touch”, and sewed on a layer of cloth, to act as a buffer between the negative and positive lines. 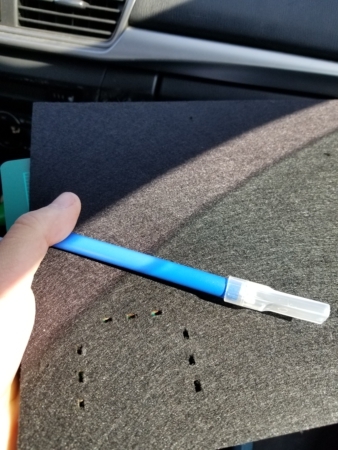 like, this piece of cloth went over the battery pack, and had holes cut out for where I wanted the needle to go through the holes of the pack. It was, very, very suspicious looking. 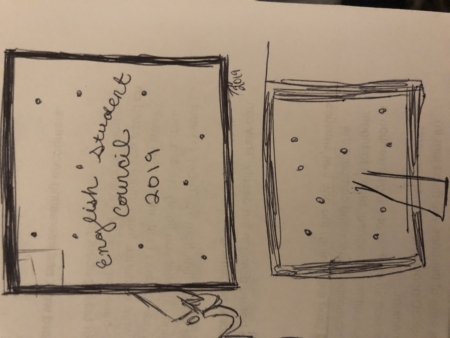 (It speaks to how sketchy it was that I don’t know whether the actual end result was more or less ugly than that diagram). And then! After all that! It didn’t work. (This is actually also a photo of the before-positive. I can promise you it didn’t work though). Anyway, at this point in time, I had left the fab lab, cut a length of the conductive thread (“just in case”), and been sewing in the positive threads at random moments. Once I realized it wasn’t working, i put it away for a while for future-me to debug. 1- not-working battery (this was actually the case but it didn’t work with a working battery either). 2- the thread didn’t work + needed more contact to work. (it was actually the other way around. I’d assumed it would need several loops of contact to have enough surface area. But even one thread was enough). 3- the LED’s weren’t working. (I couldn’t actually test this one without rethreading everything anyway). 5- repeatedly taking out the battery and putting it back in might make it work possibly maybe. (tested this many times). (this took surprisingly long on its own). At this point- about 5 PM on Sunday, I also realized I had misplaced my spare conductive thread. So, I was left with a tangle of already-used conductive thread, mostly in short chunks because taking it apart had been difficult, even after I’d realized I would need it, and tried to cut it as sparingly as possible, a pretty limited set of hours, and a good reminder of why one should test things in small increments instead of trying to do everything at once. iteration, shaoyie. anyway, once I realized you 1- don’t need that much thread to make circuits, and 2- i didn’t have to tie down the battery back with conductive thread, I wasn’t too worried, although already-used conductive thread isn’t very cooperative with being used again. I did, however, manage to mess up AGAIN, and sew down an LED the wrong way. You might see the little tiny plus and minus on there. I did too. Unfortunately I did not heed them when I was sewing it into place. “why not, shaoyie?” don’t worry, I don’t know either. Anyway, so that leaves us with the finished product! I will improve upon it in the future, possibly, but for now, this is just about it. 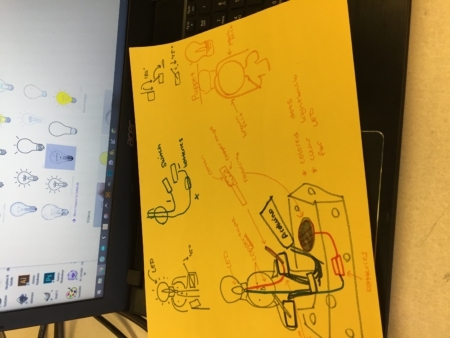 For this assignment I decided to take a whack at combining what I learned from the name tag assignment and the Arduino assignments and create a little ‘light show machine’. 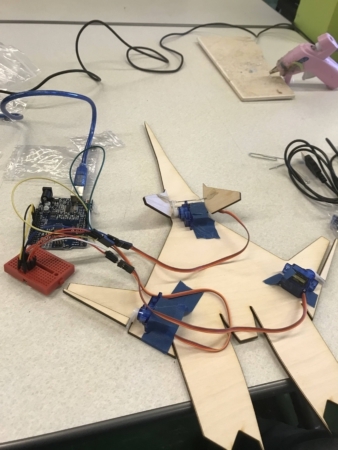 The plan for this creation is to combine more complex woodcut patterns with motors, LEDs, and an Arduino to make an object that spins the designs over top of lights to make cool patterns. 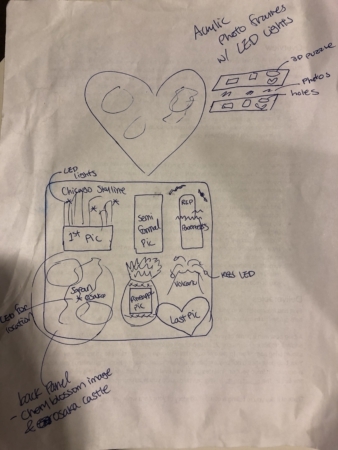 I started out this assignment in class by drawing out some ideas and creating a general sense of what I was going to do. 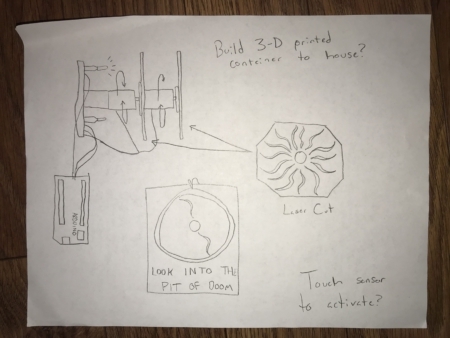 Once I started thinking more on making my light show machine, I realized that 3D printing parts would be a great way to house everything very securely and making sure that everything kept from falling apart. Given the time constraints I had, I realized I could make small 3D prints to help create the most essential parts of my machine. 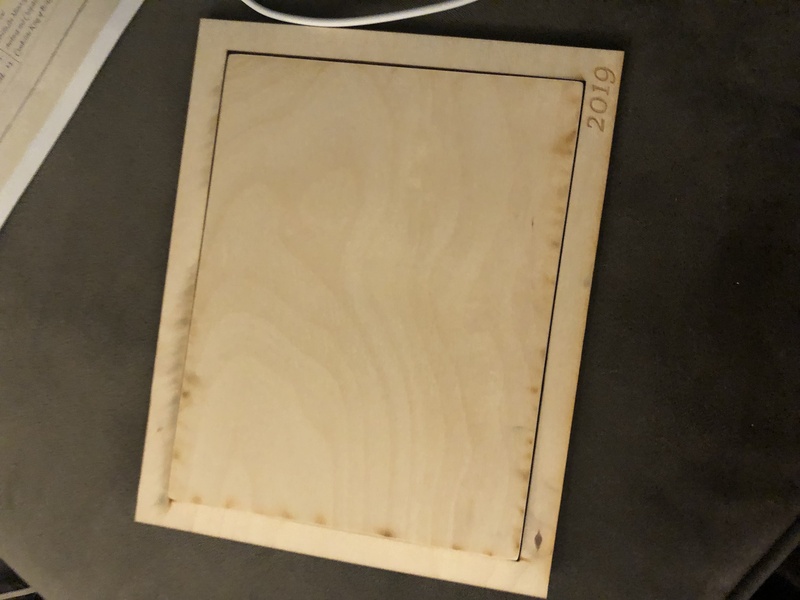 After planning out my design, I went on to laser cutting. 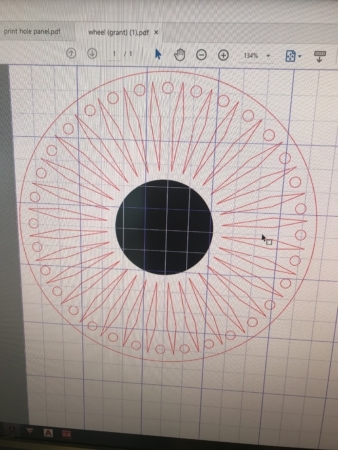 I had designed a file in Illustrator and made the design go radially, resulting in a sort of flower-like pattern for the wheels that would be spinning on my machine. Creating this pattern was easy enough, and I realized that I could go back later and create multiple different types of patterns in the future for different kinds of visual effect. 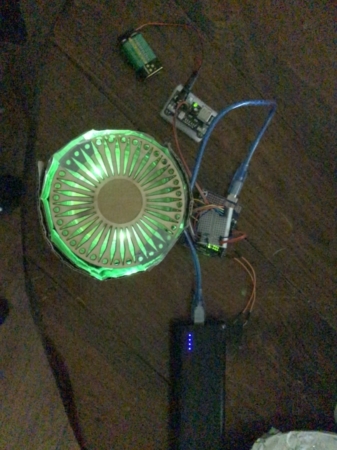 After laser cutting my wheels, I went on to setting up circuits with my Arduino and component parts (breadboard, resistors, etc.). I sat the breadboard on top of the Arduino to try and save lateral space and make the final device more column-like as opposed to plate-like. I had to work with some components during this part that I hadn’t worked with before — RGB LEDs and a 6V continuous servo motor. Wiring these in was a fairly simple task, however I quickly realized that I wouldn’t be able to run the motor and both of my RGB LEDs off the same power source feeding the board (at least without a motor controlling chip, which I should’ve asked about at the fab lab; my Arduino kit didn’t contain one). To help alleviate this problem I set up a separate controlling chip to power the wheel off of a 9V battery. The Arduino controlling the LEDs would then be powered by a computer or power brick (what I used to help make this thing a bit more portable — an initial goal of mine. Once I got that all set up I went about mapping out 3D designs for my adapter to help hold the wheel to the servo and a bracket to try and contain the breadboard and Arduino on the bottom, while housing the motor. 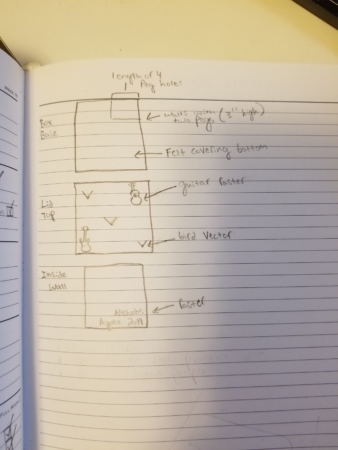 I got help from Brandon and worked in Fusion to map everything out to the mm. This part way definitely new for me, but got pretty understandable pretty quickly, so I’m glad I now can work software like that better. After printing out my component parts I headed home to assemble everything and add a piece of wax paper to the wheel that was closest to the LED (to help disperse the LED light and make it more ‘glowy’ as opposed to super direct beams). I housed my final machine in a roll of duct tape and some cardboard for the time being, as I didn’t have time to accurately measure everything and create a 3D printed housing (although at this point, I definitely want to do that). Getting everything to sit in a way that kept the servo from getting jammed was definitely a challenge, as was finding ways to house everything that are neat and still accessible. Another problem that I realized far too far into this project was that continuous servo motors can’t be controlled speed-wise in the same way that stepper servos can, at least without additional parts. I wasn’t able to take care of this before turn-in so my light show machine looks a bit more like a glowing jet engine, but I still think it’s cool. I would say that as much as I would have wanted this project to end up looking really finalized, there’s still some stuff I could add to it to make it better. I plan on 3D printing a housing for everything once I find a way that I can make it all sit uniformly. I also want to be able to make it so both wheels on the machine can spin in different directions, but this may take some more time and effort to crack. 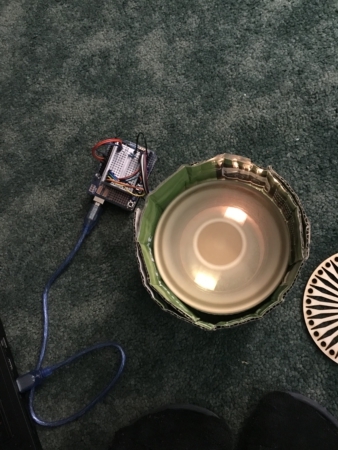 I lastly would like to be able to incorporate some type of sensor into this project, but again, I think I may need to take care of some other parts before that happens. I was really happy with what I made for this project, even if it is somewhat rough, because it really helped me use the skills I already had, expand them, as well as learn new skills I wasn’t planning on learning. 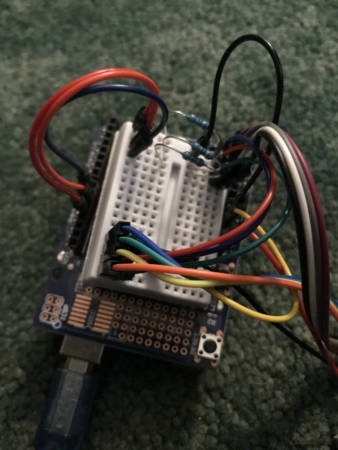 The coding on this project was fairly simple, as it usually seems with smaller arduino projects. 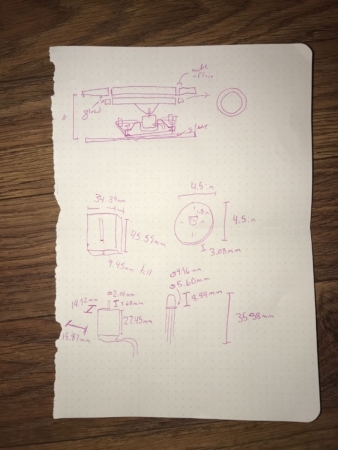 Housing and measuring things was definitely something very challenging, as well as learning to approach the different design challenges that would pop up in the process of working on my gadget. I’m excited to keep prototyping my light box and see if I can make one that really looks professional within the next couple of weeks. Maybe if I get it really right I can use it in conjunction with the speaker I plan on making for my final project! 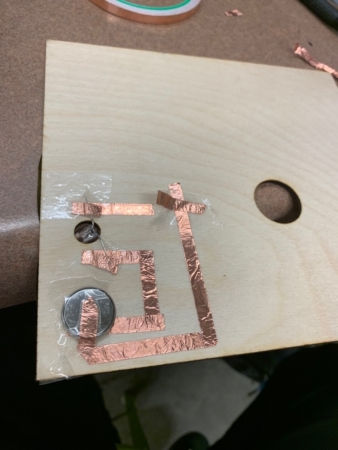 I decided to revisit my Copper Tape project since I had a bit of trouble originally completing the structure and getting the circuit to work, as the copper tape is very difficult to get working in series due to limited voltage. This time, I wanted to add in a bit of locomotion, adding in the canards and ailerons to the aircraft. To accomplish this, I would need to make use of Arduino and actual (thank gods) wires, building a more robust circuit and working with a more stable power source. Ideally, I wanted to find an Arduino PS2 joystick so I could add in some interactivity (i.e. all surfaces pitch up when the controls stick is pulled up, etc. ), but I had to settle for having the control surfaces sweep back and forth. 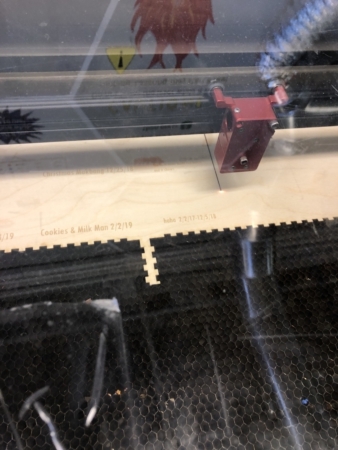 Since I wanted to add in space for servos and an Arduino board, I had to work with a bigger surface, prompting me to switch to the Laser Cutter and a 12″ x 24″ plywood board for the baseplate. As such, I had to upscale and modify my original paper template, sectioning off the control surfaces. Okay, a lot of hot glue. Two projects that I was most excited about were also two projects that didn’t go well. They are laser cutting and stickers. I wanted to iterate laser cutting and add a new feature that I have not added before which is the photos. 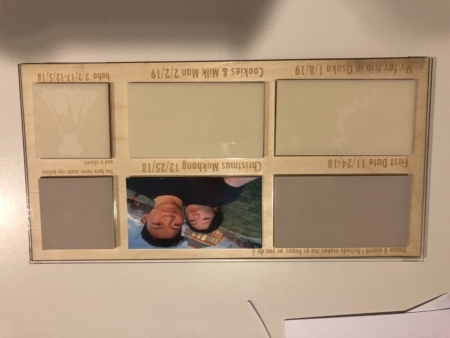 I wanted to make an acrylic photo frame for a collage of photos. Something that I can display and use it every day. This is the initial design of my project. The symbol that represents each picture is engraved (rastered) on the acrylic piece that covers the photo. I first made a main piece of the acrylic panel using the inkspace. I had to get a 12in by 6 in clear acrylic. I wanted to make a bigger frame but that would have costed a little more. First, I made different sizes of rectangles and squares for the pictures. I had to make sure the size of the shapes for resizing my photos for corresponding sizes. 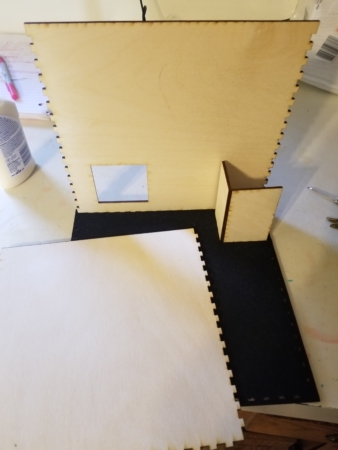 I then had to save the shapes for the wood panel on the right position so my back wooden panel has the right texts on the correct position not covering the picture frames. 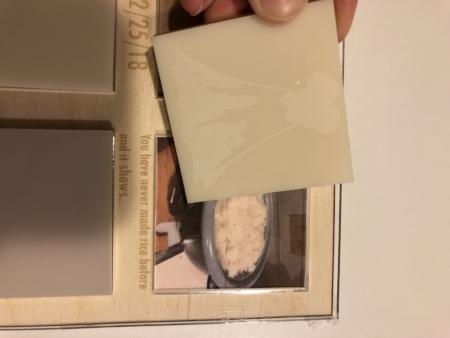 I made the same shapes so I can attach to the original clear pieces so we can easily pick up the pieces to see the photos. This time, I added the symbols to raster on the acrylic. It was difficult to find acrylic scraps that are not aggressive colors and has enough spaces for my shapes. I had to run back and forth a lot to laser cut. The rastor is kind of hard to see because the colors of the acrylic were not bold enough. I didn’t have a choice to pick other colors so that was a bummer. This is how it looks like with the pieces in. 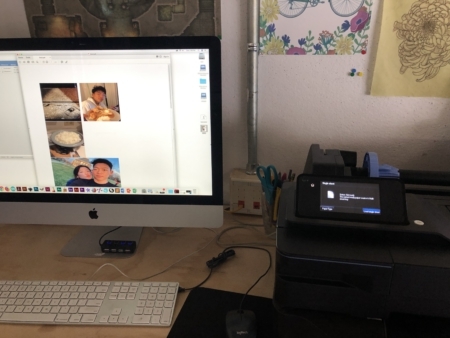 I used the poster printer to print all the photos. For some reason, it took me longer than I expected. I had to upload my photos from my iPhone to google drive. 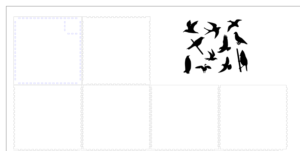 Download them and resize all of them to match my shapes. Then, I put them in one file and print them which the printer gave me a little hard time. It was hard to figure out things by myself but it felt good when I got them all printed. The photos are blurry because I had to resize them so small. this is what it looks like when the photos are in the shapes and the puzzle pieces are covering. I combined two shapes so I can pick them up easily. As you can see in the above picture, the shapes are peaking out. It turned out pretty well. Not as good as how I designed which would have taken too much time (this already took me almost 10 hours). I definitely feel more confident about laser cutting. Thanks to my classmates and people at the fab lab for helping me. It was so stressful as usual. But I’m excited to give this as a gift to my boyfriend. I hope my time and effort were worth it. I wanted to make holes to screw all the panels together but I ‘m too scared of shattering my acrylic pieces. For now, they are taped down. I will look for ways to put them together more neatly. I’m glad that I developed my laser cutting and inkspace skills through this project. I felt like I’m not confident enough in any of the materials/programs we have used so far prior to this project. However, now I think I can make more stuff using these materials/machines/programs. For my iteration assignment I decided to combine the pom pom bot assignment with the pop up card assignment and make a little robot with an LED light attachment. 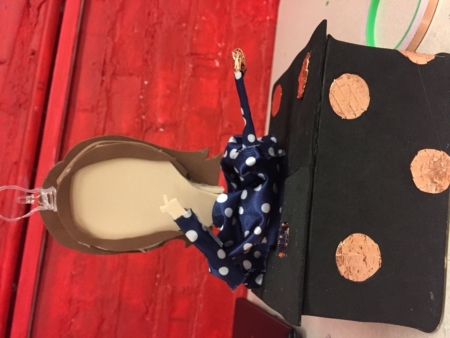 My idea was to have a puppet “connect the dots”, resulting in an idea represented by a lightbulb on her head lighting up and her hand coming to her chin. 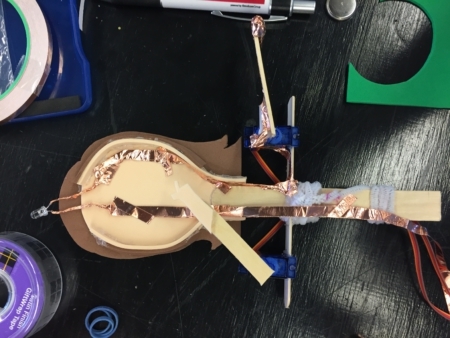 To do so, I knew I would need two servos for the arm movements and a copper wire circuit running through the puppet to the head. For the dots I decided to have a box that the puppet could sit in and be surrounded by dots. ..that I used to plan out where the wires from the servo to the arduino would run, and how the circuit would look. 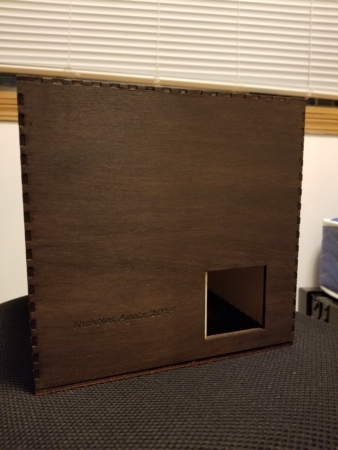 First, I created the box. I used popsicle sticks, cardboard, and hot glue. Later decorating with black foam paper and copper tape circles. 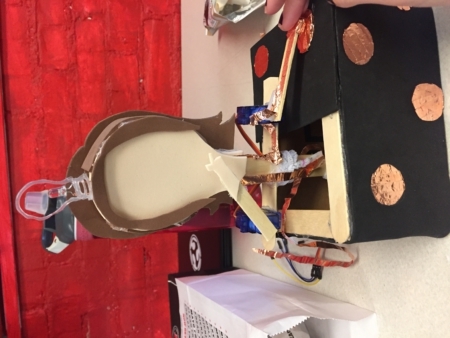 I made the bottom open, so there was room to get my fingers in yet still having enough of a floor to glue down the batteries and the puppet. I made the puppet have a 3d head, leaving the face open for now so I could insert the copper tape. The popsicle stick serves as a body and a cut through another popsicle stick made it possible to glue on some arms. The pipe cleaner serves as extra stability to make sure that the weight of the servos don’t break the puppets arms. 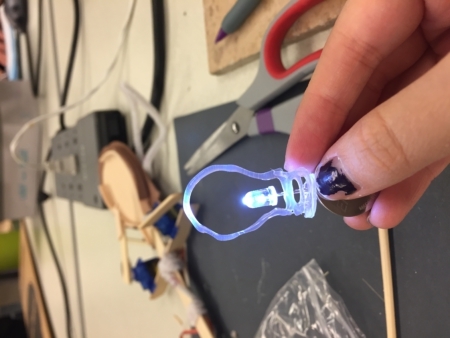 Next I made a tiny lightbulb from hot glue. Adding the copper tape. I was really concerned about conductivity here so I wrapped the tape around the LED, covering some parts twice and then taped two pieces of the tape together to form long strands. 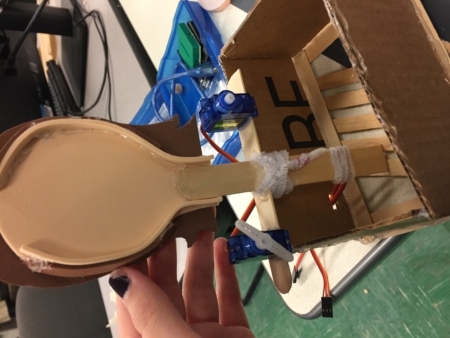 I used more tape to tape these down inside the puppet, and left enough tape loose near the button-pressing arm so that it could move to it’s highest (180*) and lowest (0*) positions without breaking the tape. Then, to Dot’s suggestion, I made the contact points for the switch uneven surfaces to increase the chance of the switch working. For the hand I wrapped a pom pom in tape to the popsicle stick I put on the servo arm. And for the other contact point I wrapped tape over a felt dot with a little tissue underneath. I glued the puppets face on and glued it into position in the box. Then I had to figure out how to get the tape and batteries in the right spot. It took a while to get the batteries in the right spot on the tape, and then to put the dot through the foam and on top of the batteries but eventually I got it, and it conducted super easily. I then added more foam to the top and made a shirt from fabric. After that, I cut black construction paper to form a bottom, since the Fab Lab only had the 1 sheet of black foam paper. The servos were plugged into the arduino and pushed through a hole in the back of the puppet, but I forgot to label which wires were which so I had to cut the bottom out and see. When it came to coding the robot, my laptop really did not mesh with the Arduino online software. I went home for the weekend and only had access to my Mac laptop. 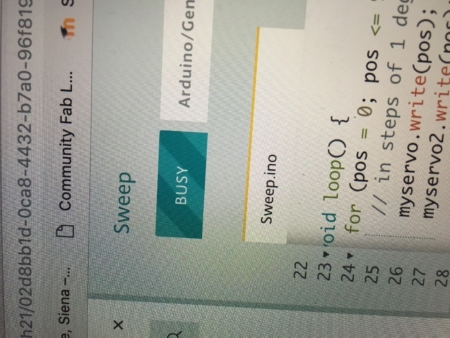 While trying different codes and positions I would constantly get the busy sign when trying to upload the code. The arm that acts as a switch for the circuit worked perfectly, but in the end I simply could not get the second arm to move. 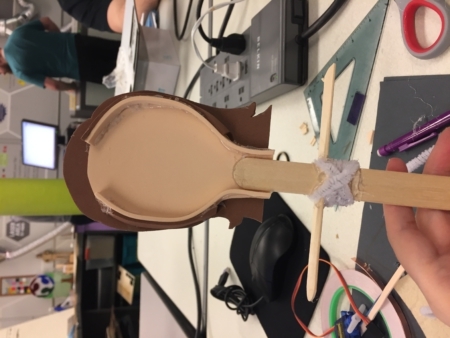 My suspicion is that a wire may have gotten knocked out inside the puppet, but it doesn’t help that I was really infrequently able to test changes in the code. All in all I’m really happy with how the robot puppet turned out! I put more TLC into this project than some of the others and it really does look like how I envisioned. I’m going to try the code again when I next have access to one of the Acers at the lab, but if that doesn’t work I might open up the bottom for a second time just to see if the problem is really with the wires. The theme of this project was iteration. Iteration is when you take a current version of something and modify it and make it better. There is not one sure fire way to iterate on a project to make it better so the sky is the limit on this project. The only catch was. that we had to use at least two techniques in conjunction, with each other, when making the iteration. 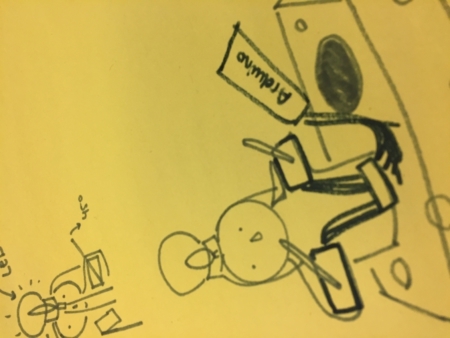 For this assignment I decided to iterate on my arduino concept project. In that assignment I simply made an arudino print text to a LCD screen. The text that was printed was dependent on which button was push, left button, or right button. Pictures 1 & 2: Picture 1 shows actively reading input. Picture 2 shows (printed on the LCD screen) what could happen if you pressed one of the buttons. How I planned to make an iteration was in three ways: physicality, better back end, and finally content. Before the iteration, the product was a skeleton that barley did anything. It was a ton of fun to breath life into this project! What I mean by “physicality” is, changing what the project looks like. To change the project physically I considered what I wanted to make over. Being me, I wanted to make a game. What is the most iconic physical manifestation of a video game then? An arcade cabinet. An arcade cabinet is the name of the console that 70’s arcade games were put into. 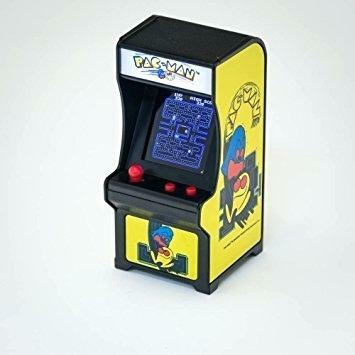 Classics like: Mrs. Pacman, Galaga, and Street Fighter can be found inside arcade cabinets. Picture 3 & 4: Dimension planning & reference photo. Here we have my plan on paper and my inspiration. Once I saw this adorable little thing on the right I got to work jotting down dimensions. I modified the drawing a bit because I thought it would be easier without it. the dimensions on the left are relative to the arduino parts that I was using. Funny enough, the base of the cabinet ended up being a square (the picture is wrong). the length of the LCD is 3.25 in and the width of the arduino is 3.25. Besides the neat presentation, the case also allows for handheld game play. The player can play the game in the palm of their hands instead of being anchored to the table. Pictures 5, 6 & 7: Arcade Shell (left) Dissection (center) Mess up (right). On the left we have the assembled shell. ideally what it would look like when completed. This shell was created by putting together two halves (center) with some wood glue. The back half of the shell turned out to not work with my design. The wires for the LCD prevented the back half from being put on. The red marking on the right picture was a marking telling me where I needed to cut. I ended up remaking the entire back half with a big window for the wires. Picture 8 & 9: Completed Front & Completed Back. The front of the cabinet looked amazing. On the left side of the picture we can see the little window where the wires get to peak through. The six cords coming through the middle are for the two buttons I will use for input. In the back we have some awesome wiring that I very proud of despite it being simple. The LCD and arduino are held together in place my rubber cement. 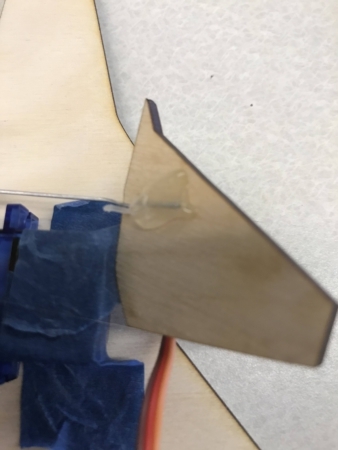 I used rubber cement because it is what works best for gluing plastic to wood. I have a full back panel that I did not put on, for ease of access reasons, that makes the back look even more clean while giving me access to the power supply. This was the most intensive change done to the original project. A better back end simply means that the coding was improved. What I did differently was, instead of just simply printing text to the screen using a void loop function, I implemented switch case functions with global variables. Switch case is basically a better if statement. Switch case functions get to bounce around depending on the situation, very manipulable through the use of global variables. Once a situation occurs I can change the global variables so that the program can jump to the right situation instead of just going down the list. Content is the game side of the project. Within the switch cases, I spun a simple dungeon crawler game. What the player picks, or doesn’t pick, will affect them as they travel through the dungeon. Also, a mechanic in the game will be the buttons changing purpose. In the original project, I made the buttons only print yes or no. Now, the buttons will change purpose per the situation. Before a battle, two lines of text will display what the buttons do. For example, I have text saying “left is defend, right is attack” before a battle. This text tells the user that the buttons now serve a different purpose. Overall, I will use this mechanic to force the player into situations where they have to ponder the consequences of their future actions. The mechanic gave the game its name, “True Dichotomy.” Because, there are literally only two options thus the true dichotomy. In the link provided one can see the project in motion. The switch case allowed the “really, no” text to come out. Since the variable counting the number of times left was pressed was one, instead of presenting nothing it jump to the next option. Overall, this project was a ton of fun! This is one of the few times where an end project actually turns out how you wanted it to turn out! One aspect of this project I would change was in the planning phase. instead of doing: construction -> coding -> turn in. I should have done: coding -> construction -> turn in. 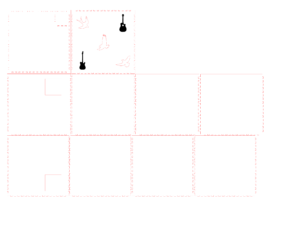 I felt that I needed to construct the physical object before I coded the game, but that was wrong. I just needed the skeleton to code the game, and debug it. This left the end product feeling rushed. 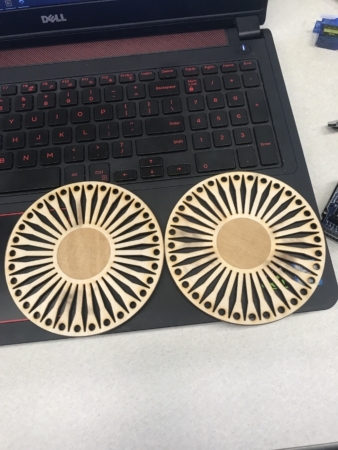 Other projects got in the way last week, so I really only was able to go to the FabLab today (extra time really helped!) thus I was only able to code the game for a couple hours. Coding the game before all this would have saved me a ton of time and stress! One final change I could make to this product is a portable battery. While one isn’t too anchored when playing the game, the 1.5 foot USB B-type cable doesn’t allow the user to stray to far from a computer. have an external power supply would really increase the portability of this product. Again, this project was super fun, and now have some thing to put on my future office desk! The several layers were difficult to apply correctly, and the red portion doesn’t pop out as much as I would have wanted it to, due to how I set the layers on top of each other. Not bad, overall. For the next sticker, I went back to inkscape and tried to come up with something really fun. I experimented with three designs. I ended up going with the makerspace logo, since the other designs ended up being far too complicated to get a clean layering, and also used different colors from what I was already using (I wanted to use up the scraps from what was left from my first sticker). Here, the most difficult part was applying the parts of the sticker right. 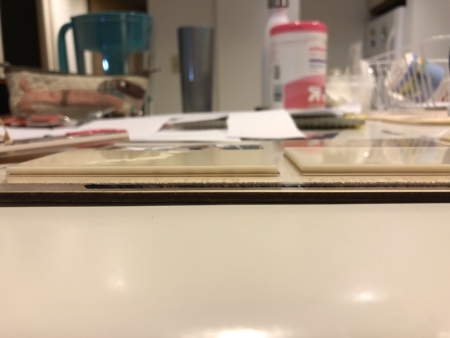 As you can see in the picture above, I used my second layer that I applied to serve as a guide for the next two layers. The end result was super clean as a result! 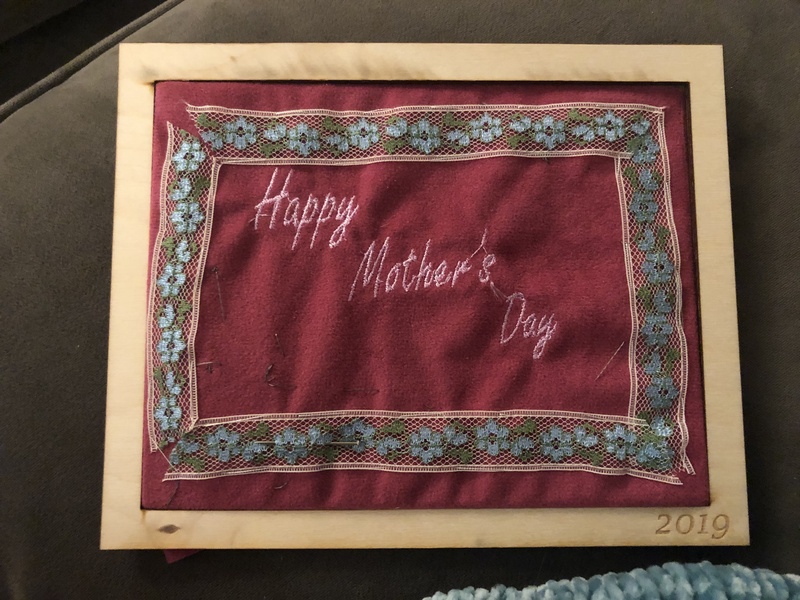 When thinking of ideas for this project, I wanted to incorporate sewing or embroidery since I really enjoyed those weeks earlier in the semester. To step up my previous work a bit, I decided to use sewable LEDs. My final work is really a combination of a couple of previous projects. 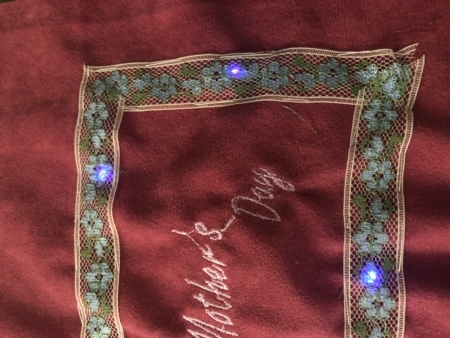 Originally, I was planning to have sewing and wood working combined to make a new name tag that wasn’t laser-engraved but embroidered and lit up with LEDs. When I thought about the usability of this, I was discouraged since it wouldn’t be very easy to use a piece of wood and cloth as a nametag. But the wood gave me the idea to make it a frame instead – that way I could make a larger piece of work and not have to limit myself to a small piece of wood. Since a frame wouldn’t make much sense I thought about making the embroidery part a quote or the name of my club that could be used as art. The first part in making this was the wood frame, which was relatively easy but I had to fiddle with it quite a bit towards the end. Once I had the measures of the frame, I could start the embroidery and make sure the text wasn’t too big or small. 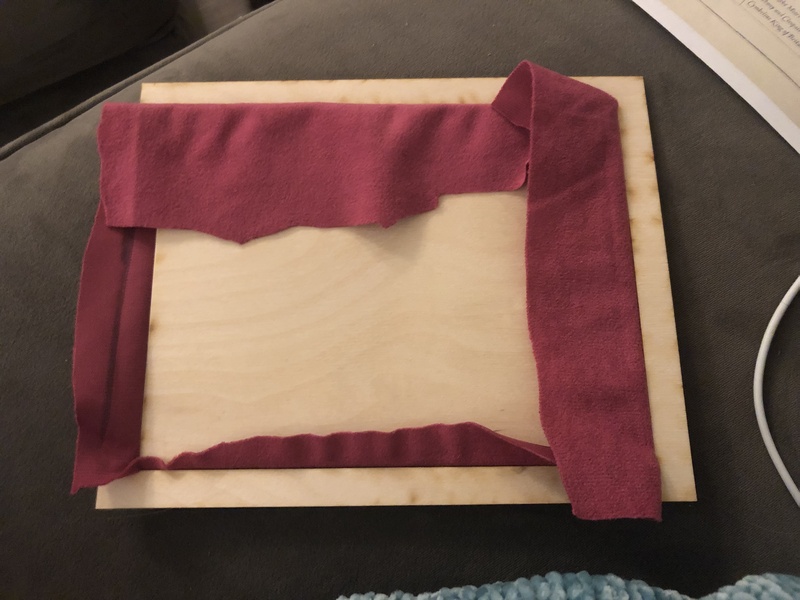 My first run with the embroidery machine was a failure since the cloth and thread caught on the machine and I had to cut the whole thing just to remove it from the machine. The frustrating thing was that it was entirely done by that point, it just wouldn’t let go without me completely cutting it off. I attempted to do a fading effect with the thread to make it switch between multiple colors, but with the stabilizer on the back of the cloth, since didn’t have the same effect that I had hoped. With my second try, I just used one color thread and it thankfully worked. After that was set, I started working with the LEDs. Sewing by hand isn’t my forte and sewing LEDs is a little finicky since you have to wrap the conductive thread around each LED multiple times in order to ensure it connects. I messed up the first time I tried this because I connected the positive side of the battery holder to the negative side of the first LED, so I was extra careful in not making that mistake again. Once I got the hang of it, it went okay but it didn’t look pretty from the right side. I tried to cover up the messy parts with a bit of trim I found which was good since you can still see through it to see the lights. It still looks a little messy since I didn’t use a sewing machine to sew any part of it, but I thought it went okay since I hadn’t had any experience with sewable LEDs. I checked the connection with a sensor and it was completely connected everywhere. I had two purple LEDs and three blue and that was a bad combination since only the blue will light up. To fit it into the frame, I sanded down the sides of the inside that was cut from the frame a lot so the cloth would fit snugly without being too loose. This worked much better than the idea I previously had about cutting multiple different sizes of wood to see which would fit better. If I had more time, I probably would have figured out how to make a hinge and an easel back so it wouldn’t have to only stand upright, but I didn’t want to attempt this without a hinge because I didn’t want it to be stuck in the same position forever. I also probably won’t be using sewable LEDs in the future even though it is a cool technology, it’s a lot of work if you’re sewing multiple on there and the battery life is very short. 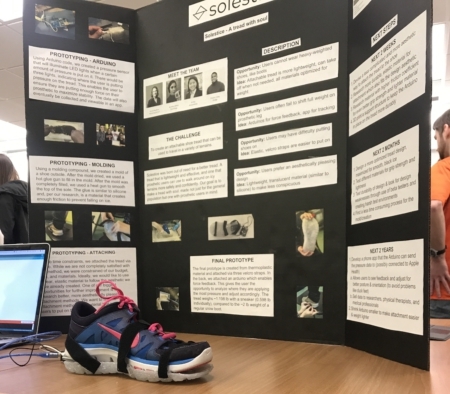 I participated in the Accessible Design Makeathon in place of the iteration assignment and joined Team Solestice from Vishal’s class. 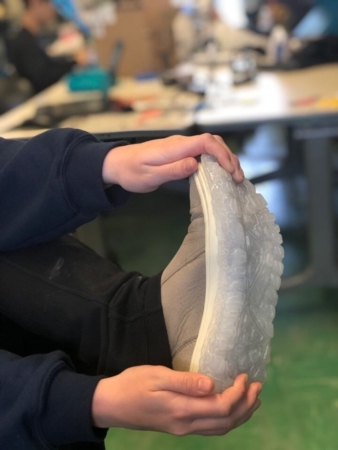 Our goal was to create an attachable shoe tread that could be used to travel in a variety of terrains. 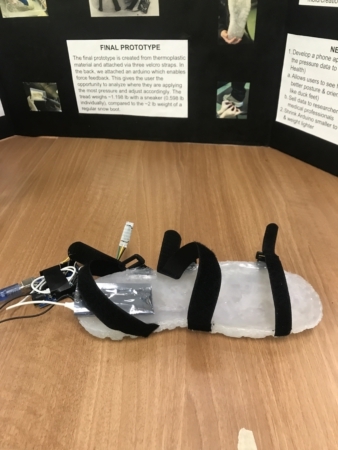 The tread would be lightweight and one that prosthetics users could use to walk around icy terrains more safely and confidently. 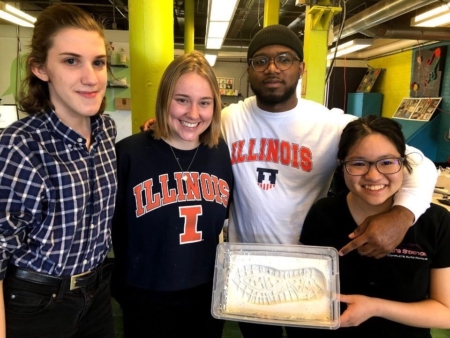 As the fab lab consultant on this team my goal was to become familiar with the project they had been working on all semester, help make the prototype, and to help them with the tools and resources. I attended the initial meet-up for presentation which is where I meet and talked to various teams, need-knowers, mentors, and team Solestice. I then met with them to discuss their progress, research, goals, their mentor’s perspective, and to prepare for the makeathon weekend. 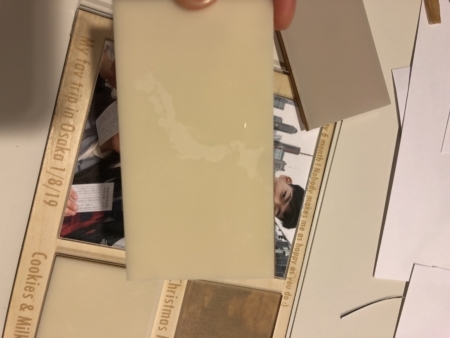 Then we had to fill the mold with a material that would work well with the mold, created stabilizing friction, was lightweight, and a little flexible. 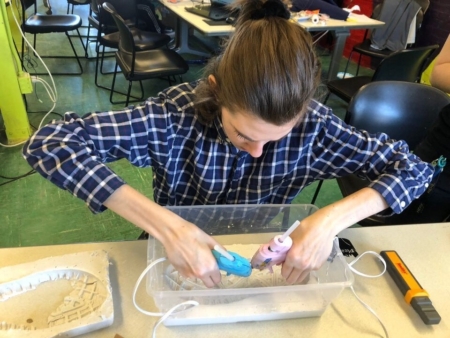 We were advised to use silicone or hot glue. We choose to use hot glue because it was better for black ice and creates enough friction to prevent falling. I spent about 3 hours filling the mold with hot glue. Then to smooth out the top of the mold I used a heat gun to melt and resettle the top layer. 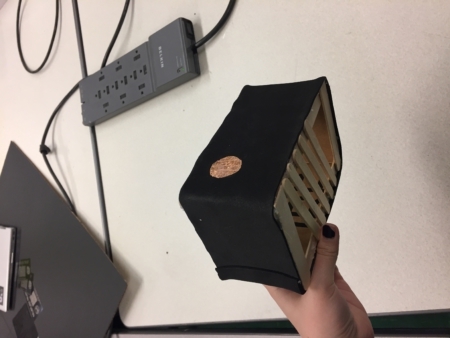 In hindsight, using the heat gun and laying glue sticks in the mold may have worked and been more time-efficient, but doing it the way we did resulted in a better prototype that filled all the small cracks in the tread mold. 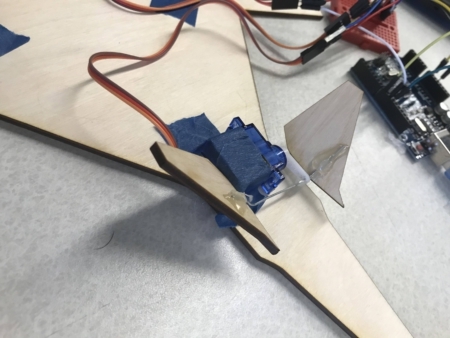 Meanwhile the other members of our team worked on the Arduino pressure sensor for the attachable tread. The Arduino would light up attached LED’s to indicate how much pressure the wearer was putting on their heel. We deicide to add this component because prosthetic leg users indicated that they had trouble knowing how much pressure they were putting on it. Adding this would help maximize stability and make our product unique from other attachable shoe treads. After the thermal glue tread was finished we started attaching the velcro straps to the tread with hot glue. 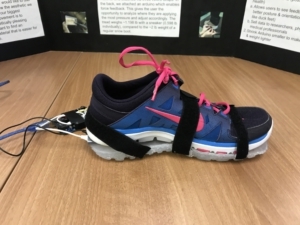 These straps were stable and tested many time to ensure maximum stability on the shoe when walking. Then we attached the pressure sensor to the back of the tread with the lights on the side. 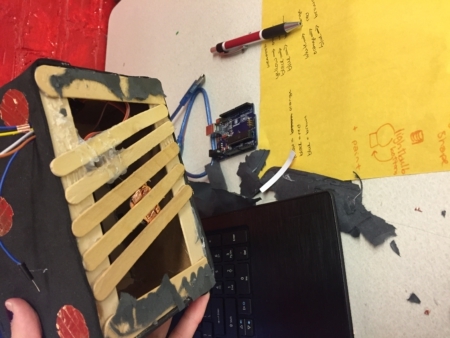 Our final prototype turned out pretty well but we ran out of time toward the end so we were unable to create an enclosure that would contain all the Arduino cords and parts on the back. Future improvements we would have made would include a 3D printed enclosure for the Arduino, a smaller Arduino board and a more aesthetic looking sensor and shoe attachments. We also created a poster and powerpoint presentation for the judging and presentation part of the Makeathon and were interviewed by a TV station. 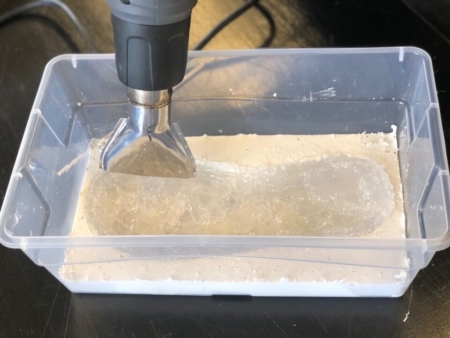 The product we ended up with would be beneficial for many people who have difficulty walking outside when it’s icy out including prosthetic leg users, older adults, and people with brittle bones. Overall, it was a long exhausting weekend but I’m really glad that I was able to be a part of this great team and participate in this Makeathon.